This video discusses the differences between the Somatic Female Narcissist and a typical Male Narcissist. Psychotherapist Terri Cole discusses Traits and Red Flags, to help you tell if you are dating a Narcissist. When it comes to being in a relationship with a narcissist, it’s difficult to find any real intimacy because everything is about your functionality in their life. Narcissists can love only on a superficial level. As long as you are doing what they think you are supposed to be doing, all is well (and when i say ‘well’ I mean they get what they want and you stay unsatisfied, unseen and unheard.) The moment you deny them exactly what they want, look out! They will explode, get mean and do just about anything to get you back in line with their plan. If you don’t comply, they will leave. Actions and conversations with a narcissist all revolve around building them up, even when it’s “about you,” it’s really about them – they get to “show you off to their friends.” That isn’t about you at all. It’s about their ego and how you make them look. You can learn more about Terri Cole by visiting her website by clicking on this line. Terri Cole’s video above, reminded me of a particular Somatic Narcissist that I once had to deal with. The female had called police about a verbal argument with her husband saying that she had feared for her life. The Police came to the home, but the husband was no longer there. The police informed her about getting a Protection From Abuse Order. She indicated that she would do so, but never followed through. Trauma Bonding messes up the logical thinking of the abused victim. If the Police are suggesting to get a Protection From Abuse Order, then do it. The husband apparently purchased a legal handgun the following day. Abusive and Disordered people fear abandonment. Some fear abandonment more than they fear death. The abuse is to keep the victim in line and under control. The Disordered Individual cannot handle losing control. One solution is to eliminate the problem. Because Narcissists know right from wrong (unlike with Psychopaths where right or wrong do not exist) they will realize that they just murdered their family. The embarrassment of going to trial and media attention would be too great for their fragile Ego to handle. So they kill themselves. If you are in an abusive relationship and considering leaving, please contact your local Law Enforcement. They can also inform you of other assistance available to you – like Battered Women’s Shelters. Listen to the Police and follow through by getting any suggested Court Orders. By getting Law Enforcement to visit the family home, a Disordered Individual such as an abusive Narcissist could reconsider escalating the violence, since it has now been made public. It anything goes to Court, a Police Officer’s testimony will trump a Narcissist’s great sounding BS. The video below is a Heads Up that Disordered Individuals can damage way more than your emotional well being. They can literally destroy you and possibly your children. Learning about the Red Flags to watch for is so very important. Better to walk away when multiple Red Flags are displayed, than becoming involved with a Disordered Individuals and later getting emotionally and or physicically abused or even killed. Bree Bonchay is also the author of the book titled: “I Am Free: Healing Stories About Surviving Toxic Relationships With Narcissists And Sociopaths“. Click on this Link to visit Amazon.com to learn more about purchasing Bree Bonchay’s book. How to Improve your Narcissist Radar and be able to Spot Narcissists Faster. A “rather novel” way to learn how Narcissists act. Sit back and watch for a Narcissist’s Red Flags, Traits and Manipulations. Fine tune your Narcissist Radar and Spot Narcissists Faster. Usage tip. When the slides below start to display and if you have a mouse with a center wheel on the top of the mouse, place your cursor onto the displayed slide. Now turn that center wheel and you can scroll back and forth thru the slides, using the center wheel. I find it easier to do that, than to use the arrows just below the slide display. There are a few posts on this site which discuss the major Red Flags to watch for. Those are typical and obvious Red Flags, which many have posted about. This video goes beyond that. Dr. Rose Moten discuss less obvious behavioural Red Flags which could be mistaken as your “other” being Love Struck with you. Lots of points to learn and keep in mind when starting a new relationship. Behaviour which does not stand out, like Love Bombing or Mirroring, can be easily dismissed. Red Flags should be noted. The more Red Flags found, increases the odds that you could be interacting with a Disordered Individual. A friend made an interesting comment. It was about a female Somatic Narcissist which we both know. My friend made a comment that she was much like a Spider. She would create a fine Spider’s Web to trap you in. Once trapped she would do whatever she wanted to you. She could be devilishly charming, always wanting to be the center of everyone’s attention. She made sure that everyone knew that she was there. She would work at trying to build you up. Love Bombing you with compliments and talk of being kindred spirits. Eventually the “Discard phase” would arrive with the backstabbing and smear campaign. The idea of her being like a Spider was interesting. Narcissists really are like Spiders. They build a web of lies and half truths, much like a Spider builds it’s Spider’s Web. Once they have their prey in their web, the Spider will feed off it. With the Narcissist you become a Source of Narcissistic Supply, which they will feed on. Eventually they find a new and to them better Source of Narcissistic Supply, so you get discarded. All that is left of a Spider’s prey is an empty shell. Survivors of narcissistic abuse will tell you that they are not the same person that they were before hooking up with their Narcissist. Narcissists lack Empathy for others. Spiders also don’t care about the prey that they trap in their web. Both Spiders and Narcissists will happily Feed off their prey. Both Spiders and Narcissists are also always looking to trap more victims in their web. My friend is not knowledgeable about the DSM-4 & 5 profile of people afflicted with Narcissistic Personality Disorder, but his analogy of referring to this female as being like a Spider was extraordinarily perceptive and in my opinion sadly dead on. She is clearly someone to stay the hell away from. Narcissist Suzie gets a new victim. Episode 1 – Falling into the trap. This video gives one an insight into the behaviour, thinking and traits of a Narcissist. I love the line in the video where she states “I think you are my Soul Mate“. That line, and variations of it, is a Narcissist favorite to use during the Love Bombing phase. BTW, once you have been “primed” by a Narcissist, other Narcissists are able to pick you out of a crowd (see this prior post about a really informative lecture from Christine De Canonville). Narcissist Suzie gets a new victim. How to spot a narcissist next time round before it’s too late. Being in a relationship with a Narcissist once is your life, is in my opinion one time too many. This video presentation is from the heart by someone who sadly has been there and done that. So I’m not going to give you a list of things to look out for because I actually believe that doesn’t help at all. I think the most important thing to do is start paying attention to your own feelings inside while you are with that person. to make sure that you are meeting your own needs first. to pay attention to how you feel in the company of this person and I’m not talking about the in love feeling. how much you enjoy all the other interactions with this person and how this person reacts when you are meeting you are needs first on an ongoing basis. also picked up on the energy this person is emitting and how it is influencing you. On some occasions it’s going to take you a while to realize someone is narcissistic or dysfunctional, but you will notice it after a short while if you are paying attention to your own needs and feelings, and then you can move on with grace. The more healed you are inside as far as your emotional wounds the less your chances of actually ending up in a serious relationship with a narcissist. that’s why focusing on yourself is the most important criteria when it comes to narcissists and abuse. Unfortunately the narcissist is like water he just molds to whatever receptacle he is poured into so sometimes it’s near impossible to pick up his narcissism from a checklist. Click on this line to also visit the the Daylight out of Darkness Google Plus website. Click on this line to visit the Daylight out of Darkness Facebook page. Permission was granted via a Creative Commons License to include the long Quote above into this post. 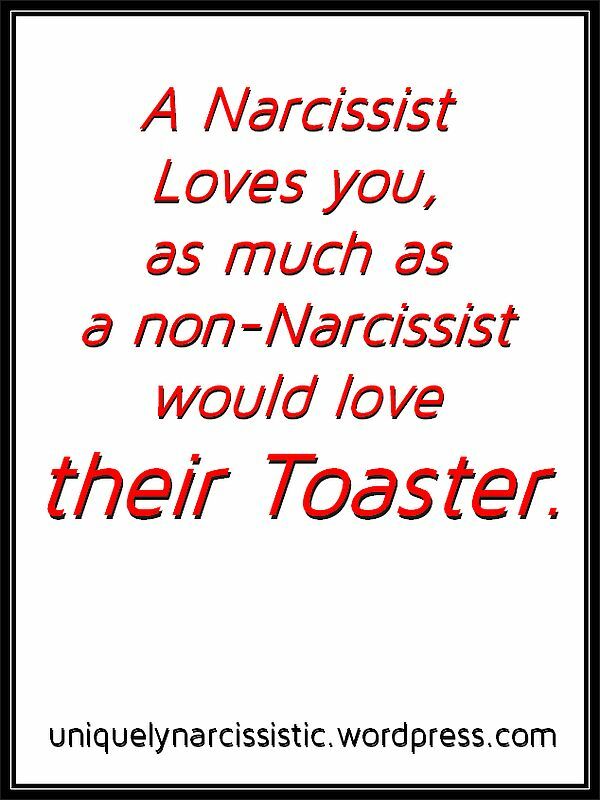 Narcissists can be very Charming. That is until you figure out why they are being so Charming. In this video Tracy Malone discusses how the Narcissists who had crossed paths with her were Oh So Charming. This is another Major Red Flag to carefully watch for. Tracy Malone’s videos go into intimate details about of the Red Flags of the Narcissists who had crossed her path. In this video she discusses “Rushing Intimacy” as being a major Red Flag to watch out for. She also describes. from the Heart, what she is going thru while recovering from Narcissistic Abuse. May I suggest to check out Tracy Malone’s YouTube channel. Really grateful that she allows the sharing of her superb videos. This video discusses “Lack of Object Constancy” which is another Trait and Red Flag of a Narcissist to watch for. 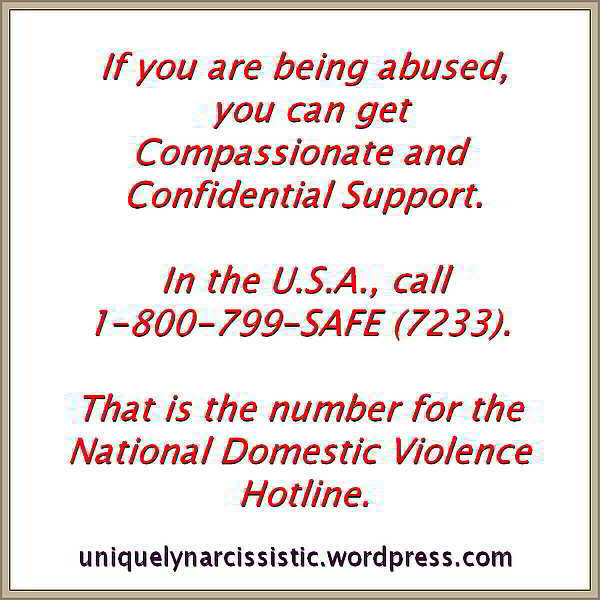 Click on this line to visit the Narcissistic Abuse Victim Syndrome Facebook page. The video below is posted by someone suffering from Borderline Personality Disorder. She discusses a therapy session about Lack of Object Constancy. What she mentions, also applies to Narcissists. Note that she is actively seeking treatment via Therapy Sessions, which is something a Narcissist would rarely (if ever) do. Click on this line to visit the Out of The Fog website to read their post titled : Lack of Object Constancy. Good article about the Narcissistic use of “Denial”, which is yet another Narcissist Trait and Red Flag to watch out for. I recall one time being told “Why would I have said something like that?”, How does a “rational” person respond to someone denying something which they clearly said or did? They also do not blink their eyes when making their denial. Non-Narcissists will generally blink their eyes when they tell a lie. If you have to negotiate business with a narcissist or psychopath, you’re better off doing it on Facebook, research from UBC Okanagan shows. The study, titled “The Dark Side of Negotiation”, was conducted between October 2013 and February 2014 and included more than 200 Canadian university students, a proportion of whom were identified as having various qualities on the DT spectrum. The above post is reprinted from materials provided by University of British Columbia. Click on these 2 lines to view the original post on the UBC website. NOTE: No text was changed. We did add colour and enlarged the text of certain portions. Uniquely Narcissistic Thanks UBC for permission to share this post.